A middle-aged man, built like a former football player with hair dyed an unnatural shade of yellow, stood behind the podium. Two black men in uniform, one the Police Chef and the other the County Sheriff flanked him. Several County Commissioners shifted nervously to his right. He started to say something, but stopped. He looked down at his notes and turned them over. He looked out over the crowed, dabbed his eyes then took a deep breath. “Fox… My son, Fox is a gay twenty-three year old man. He could have been in that club last night. I could have been in that club. I’ve had a drink with my son down at the Jolly Roger on occasion. Gay sons, lesbian daughters, our trans family members and friends were attacked earlier this morning. Mothers, fathers, brothers, and friends supporting their LGBT loved ones were gunned down. “Politicians posturing about whether it was Islamic terrorist or a home grown hate crime are irrelevant at this moment. Lives have been shattered. Our LGBT community has been attacked. You must know we stand with you. 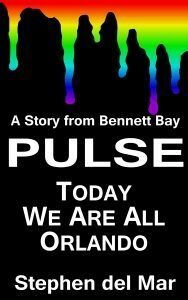 As has been echoed across the country and around the world… today, We are all Orlando. “We are putting the haters on notice that the flame of LGBT Pride burns bright in this City by the Bay. The Spirit of Esperanza, the Spirit of Hope, which those Spanish explores found here four-hundred years ago as they sheltered from a raging storm is still here. Dieter nodded and moved in to nuzzle him. Yanko whispered in his ear.